Hundreds of letters and messages, including 14 encyclicals and 3 books. Karol Wojtyla was born in Wadowice, Poland, on 18 May 1920, the son of a captain in the Polish army and a school teacher. His mother died when he was eight years old and his elder brother died when he was twelve. In 1938 he entered the Jagiellonian University in Cracow to read language and literature in the department of philosophy. His studies were interrupted by the war and he went to work in a stone quarry and then a chemical plant. After his father's death in 1942 he entered the secret seminary (college for the training of priests) in Cracow. 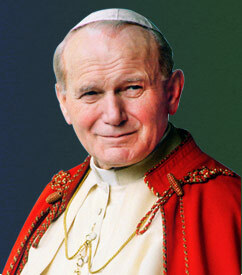 Wojtyla was ordained priest in 1946 and sent to Rome to complete his studies. There he obtained a doctorate from the Pontifical Angelicum University. Returning to Poland, he worked as assistant priest in a village parish and as chaplain to university students, while continuing his studies for a second doctorate at the Catholic University of Lublin. In 1953 he began teaching at the university. On September 28, 1958, Wojtyla was made an Auxiliary Bishop of Cracow, and then its Archbishop on January 13,1964, the first residential Archbishop of that Diocese since 1951 (because of communist restrictions). He went to Rome for the Second Vatican Council and attended all its sessions from October 1962 to December 1965. He was a contributor to three documents that emerged from the Council, the Constitution on the Church in the Modern World (Gaudium et Spes), the Declaration on Religious Freedom (Dignitatis Humanae) and the Decree on the Instruments on Social Communication (Inter Mirifica). In August 1978 Pope Paul VI died and his successor (Pope John Paul I) lived for just 33 days on the papal throne. On 16 October, the second day of voting, Cardinal Wojtyla was elected Pope and chose the name John Paul in honour of his predecessor. He was the first Polish Pope and the first non-Italian since the Dutchman Adrian VI (1522-1523). He was the youngest (58) at the time of his election since Pius IX (1846-1878). In May 1998 he became the longest reigning Pope of this century. Besides taking part in Vatican Council II with an important contribution to the elaboration of the Constitution Gaudium et Spes, Cardinal Wojtyla participated in all the assemblies of the Synod of Bishops. Since the start of his Pontificate on October 16, 1978, Pope John Paul II completed 104 pastoral visits outside of Italy and 146 within Italy. As Bishop of Rome he visited 317 of the 333 parishes. His principal documents include 14 encyclicals, 15 apostolic exhortations, 11 apostolic constitutions and 44 apostolic letters. The Pope also published five books: "Crossing the Threshold of Hope" (October 1994); "Gift and Mystery: On the 50th Anniversary of My Priestly Ordination" (November 1996); "Roman Triptych - Meditations", a book of poems (March 2003); "Rise, Let Us Be On Our Way" (May 2004) and "Memory and Identity" (publication spring 2005). John Paul II presided at 147 beatification ceremonies (1,338 Blesseds proclaimed) and 51 canonization ceremonies (482 Saints) during his pontificate. He held 9 consistories in which he created 231 (+ 1 in pectore) cardinals. He also convened six plenary meetings of the College of Cardinals. From 1978 to 2005, presided at 15 Synods of Bishops: six ordinary (1980, 1983, 1987, 1990, 1994, 2001), one extraordinary (1985) and eight special (1980, 1991, 1994, 1995, 1997, 1998  and 1999). No other Pope encountered so many individuals like John Paul II: to date, more than 17,600,000 pilgrims have participated in the General Audiences held on Wednesdays (more than 1,160). Such figure is without counting all other special audiences and religious ceremonies held [more than 8 million pilgrims during the Great Jubilee of the Year 2000 alone] and the millions of faithful met during pastoral visits made in Italy and throughout the world. It must also be remembered the numerous government personalities encountered during 38 official visits and in the 737 audiences and meetings held with Heads of State, and even the 245 audiences and meetings with Prime Ministers.